Let’s say you’re flying on a German airline and you’re riding in style up in business class. What would you like to see in the lounge before you go? That’s right, a German beer garden. And now you can. Lufthansa has installed a beer garden in its newly-refurbished Munich lounge, and I love it. They should roll this out to every lounge in the system. 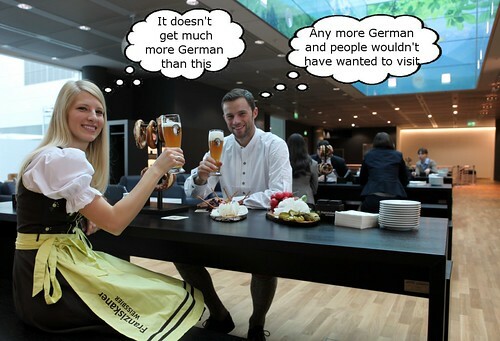 When you’re flying Lufthansa, you’re expecting a German experience. I realize that beer halls are more of a Bavarian thing, so it makes sense it’s in Munich, but I’d like to see that kind of character in lounges all over. I want my airline’s personality to come out from my first interaction, and this certainly does that for Lufthansa.